OK, let's acknowledge the elephant giraffe in the room about Aaron Slegers right away: the dude is tall. Really Tall. Six-ten Tall. Man-among-boys Tall. Hows-the-weather-up-there Tall. Blade-of-grass-the-lawnmower-missed Tall. He-must-be-sick-of-hearing-about-it Tall. OK, with the height out of the way, what do we know about him? 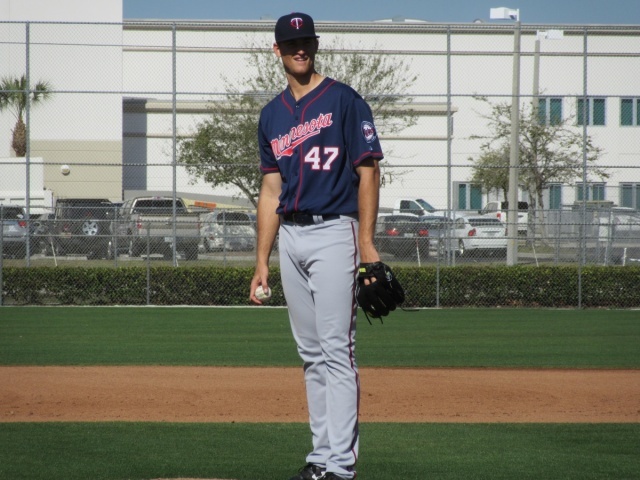 The Twins signed him in 2013 after a three-year career at Indiana University, where he won Big Ten Conference Baseball Pitcher of the Year honors in 2013, putting him in good company with Tyler Jay (UI 2015), Alex Wimmers (OSU 2009-10), and Glen Perkins (UM 2004). After an initial season in Elizabethtown he has moved up in the organization with pretty good speed, seeing time in both Cedar Rapids (A) and Ft Myers (A+) in 2014, Ft Myers and Chattanooga in 2015, and then Chattanooga again in 2016. You can look up his numbers at the above link better than I can repeat them. He has done well at every stop - never consistently dominant, but always a workhorse getting the job done. Aside from his get-the-feet-wet time in Rookie ball, he's been used strictly as a starting pitcher. He has a good fastball - I saw 94 on the radar gun during the one Spring game of his I watched, or 91 at times (maybe a sinker?). Off-speed at 86 but I don't know if he has anything really slow in his arsenal. He got a very nice "failed checked swing" for a strike 3 on one batter, and in the next inning I saw another called 3rd strike for a 3rd out. I have no idea if those were changeups or sliders. But those batters at least were not able to get a good read on his delivery - if it were the changeup it would be sweet - good two-strike changeups are always sweet, at least except if the batter is sitting on it. Here is Seth Stoh's most recent TD article about Slegers, which contains lots of good tidbits that I won't (directly ) plagiarize. Bottom line for me: he passes the eye test, and he passes the stats test, and he passes the Seth test, and he passes the "organization has faith in him" test (which means I can dispense with the other tests). He's got a chance. Aaron made his first 2017 start at AAA last night, and weaved in and out of trouble in several of the six innings he worked. He gave up a walk to the very first batter in the bottom of the first, and an eventual throwing error by shortstop Goodrum after two forceouts advanced the remaining runner to second before Slegers quelled the mini-rally with a key strikeout. The second inning was clean, with another strikeout, but in the third a one-out walk was erased only due to a double play on a lineout to Palka in right. Inning four saw another leadoff walk, followed by a steal and a sac fly to center, but Slegers managed to strand the runner at third with an infield pop and then another clutch strikeout. He found his stride in innings five and six, with no baserunners, getting a strikeout looking to end the fifth and then two swinging strikeouts in the sixth followed by a fly out to end his evening's work, after no doubt reaching his pitch-count limit at 81 with 48 of them strikes. Oh, who am I kidding? Have I mentioned any base hits? NO! I've buried the lede: he stood tall and no-hit Buffalo for all six innings, striking out seven to go with the three walks, leaving the game with a 1-0 lead that the Red Wing hitters managed to extend to 5-0 before it was all over. Not surprisingly, he took Twins Daily honors for Pitcher of the Day. Congratulations to Aaron Slegers for an outstanding game! Bad game this afternoon/evening: 3.2 innings, 11 hits including 1 homer, 1 walk, 5 runs. The visiting Syracuse Chiefs batted around in the first inning for 4 of the runs, on their way to an eventual 7-6 win over Rochester. Aaron did record 6 strikeouts. Forget this start. Didn't happen. Move on to the next one, Big Guy. Aaron endured another poor game on Saturday the 22nd. In 5 innings of work, comprising 81 pitches, he surrendered 7 runs, 6 of them earned, on 10 hits which included 3 doubles. He walked only 1 batter, and struck out 3. This outing brings his season ERA to an elevated 6.75. This afternoon in Rochester, Aaron Slegers found his big-boy stuff again, and stifled the Looieville Bats as the Red Wings won 7-1. That solitary marker in the sixth of his eight innings of work was unearned - although I'll offer the unsolicited editorial view that giving the pitcher a break by the rulebook is not completely sensible when it's his own muffed catch at first base that was the cause. First baseman Matt Hague still got credit for his assist on the play, so the rulebook at least metes out that much justice. Aside from the error, there was also a wild pitch and a passed ball by Garver that moved runners up here and there - in all honesty Slegers worked in and out of moderate trouble at times - he did have 1-2-3 innings in the third and the fifth. Seven hits, one walk, four strikeouts. Most impressively, perhaps, he needed only 92 pitches - fewer than 3 pitches per batter. All in all, with a light breeze blowing out, it was a nice day's work. This brings his season ERA back down to 4.37. Aaron Slegers made the start and lasted four innings, getting knocked around for five runs on seven hits and one walk. He struck out two. And just like that, Aaron turns it around and is riding tall in the saddle again. He earned TD Minor League Pitcher of the Day honors Saturday afternoon by throttling the Pawtucket Red Sox en route to a 3-1 win. The PawSox didn't register a hit until the 7th inning, but in the 8th a leadoff homer by Ryan Court followed by a one-out double from Dan Butler necessitated a call to the Red Wings bullpen. In summary, he went 7 and 1/3 innings, giving up the 3 hits plus 1 walk, registering 5 strikeouts. 67 of his 92 pitches were for strikes. He struck out the side in the third inning, all on swinging third strikes. This nice game lowered his season ERA to 4.50, and evened his win-loss record at 3-3. Another towering start for Aaron on May 19. Eight and one-third innings, covering 98 pitches, and the results were 1 earned run on 5 hits and 1 walk. He induced 17 grounders versus only 11 flyballs, and 64 of his pitches were for strikes. In only one inning, the 9th when the run scored, did as many as two opponents reach base. Only a couple of strikeouts, if you like looking for the dark cloud behind every silver lining. Rochester needed him to pitch this well, as they scored only two of their own, for the victory over the Scranton/Wilkes-Barre Geography Quiz Answers or whatever the heck they are calling themselves. 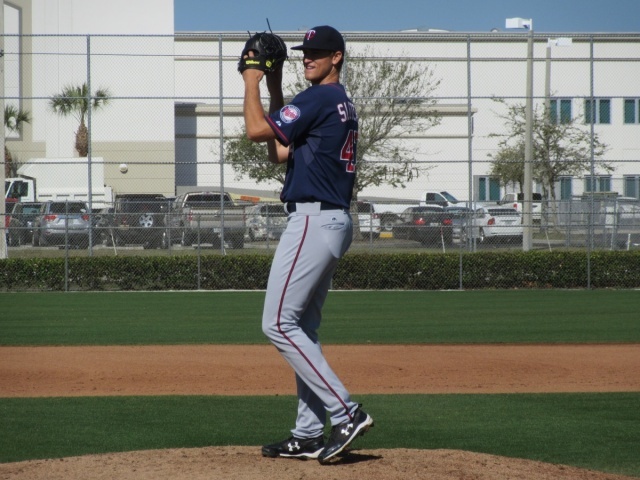 For his second straight game, Aaron Slegers won Twins Daily Minor League Pitcher of the Day honors. It's no tall tale to state that Slegers pitched effectively versus Durham on Wednesday, May 24. He threw 6 innings and gave up 6 hits and no walks, surrendering 2 earned runs in the process while striking out 5. The two runs came in the top of the third, on four straight base hits before an out could be recorded. But he quelled the rally with a couple of infield grounders, the second of which resulted in an unusual double play by Hague and Vielma, where one of the outs apparently occurred at third base unforced but the game log shows 3-6-3. I would need to do more research to puzzle this one out. The other hits Aaron gave up were a harmless two-out double in the sixth, and then a single to lead off the seventh which ended his evening's work. He departed with a 4-2 lead. Busenitz snuffed that small fire, but then in the 8th he and the rest of the bullpen that followed completely fell apart, resulting by game's end in a disappointing 6-5 loss. The game improved Slegers's season ERA to 3.72. It was his first no-decision of the season; his W-L record remains at 4-3. Aaron took a giant stride toward the consistency he no doubt needs to demonstrate to the Twins brass, with a quality start versus Indianapolis on Memorial Day, May 29. In 6 full innings of work he surrendered only 6 hits and 1 walk, striking out 7 batters. This makes four straight solid outings in his ledger. The Indians did score three runs against him, slightly raising his season ERA to 3.81. Two of those runs came courtesy of a fourth-inning homer by Elias Diaz; the other tally came in the sixth via a double and a wild pitch followed by a single. Slegers departed with a 3-1 deficit, having reached his likely planned limit with a pitch count of 101 (66 for strikes), but the Red Wing batters bailed him out in the bottom of the 8th with 4 runs, and Michael Tonkin picked up the 5-3 win with three effective innings of relief to close out the game. Aaron received highest honors as Twins Minor League Starting Pitcher of the Month for May 2017! Excellent job cross-linking your prospect! Aaron had a so-so game against Norfolk on June 8. He was engaged in a 0-0 pitchers' duel through 5 innings, but three of those innings were a struggle for him with multiple baserunners. He did have a clean 1-2-3 inning in the third and fifth. But repeatedly walking the tightrope was too tall a task, and in the top of the sixth the Tides broke through for 3 earned runs on four base hits (two doubles). Slegers pitched into the seventh and another clean inning was within his grasp, but he departed with two outs after walking cleanup hitter Brandon Snyder and thus reaching 106 pitches; his line would have looked a little better if he could have put that chump away. All told, he gave up 8 hits and 3 walks in those 6.2 innings, and got 4 strikeouts. Rochester countered with 2 runs in the bottom of that fateful 6th inning, but that's the way the score remained. The game lowered his season ERA ever so slightly, to 4.23. Slegers had a somewhat higher-level game against the Scranton/Wilkes-Barre RailRiders in an 8-2 win on Thursday night, June 15. On the negative side, he required 94 pitches to cover only 5 full innings, and his first inning was rough with three singles, a run coming in on the second of those. Among the positives was that he limited the opponents to that one run, and only one runner made it as far as second base the rest of his outing. He averaged a strikeout per inning, while walking only two. Contributing to the low scoring number was that none of the six hits was of the extra-base variety. He now has a season ERA of 4.06. Tuesday night, June 20, Aaron got the decision in a 4-3 win over the visiting Buffalo Bisons. In what has become something of a pattern, he pitched well in the early innings, but weakened and needed relief help mid-game. Until the sixth, the only run was a solo home run by Christian Lopes in the third. But in that sixth, he gave up a couple of walks and a couple of singles, resulting in a pair of runs, and with two out he was lifted in favor of Jake Reed who got a key strikeout to close the inning. He had reached 91 pitches. Altogether, 5.2 innings with 3 runs on 6 hits and 3 walks to go with 6 strikeouts isn't bad, but isn't really of great stature either. He was so close to getting out of it, though. His season ERA ticks upward to 4.11, and his W-L record improves to 6-4. Aaron Slegers got the 4-2 win in an abbreviated start at the Buffalo Bisons on Monday, June 26. The seven-inning game was part of a AAA double-header, which Rochester swept, so perhaps a desire to get two relievers into the game factored into the choice to lift the starter after only 86 pitches and five innings. It was a decent game for the righty, though not the loftiest of his season. He gave up seven hits and two walks, to go with four strikeouts. Four of the base hits were doubles. Buffalo got two-out tallies in each of the second and third innings - one came on a pair of doubles (which sandwiched a balk that turned out not to be instrumental), the other on a run-scoring single after a double and a wild pitch. Aaron did not manage to achieve a 1-2-3 inning during the game. His W-L is now 7-4, and his ERA continues to hover just above 4. Aaron's game against Lehigh Valley on July 3 was his fifth straight "decent" start - neither sky-high nor low-down, simply the kind of start that gives your team a chance to win. Rochester did not need even this level of quality, as they bopped the opponents for 12 runs of their own. The Iron Pigs garnered 3 runs on 7 hits and a couple of walks in 6.2 innings against Slegers. Two of their hits were of the extra-base variety, and he got 6 strikeouts off of them. The relief work from Rucinski and Curtiss was solid, and the game was never in much doubt after the fifth inning. Aaron is tied for the league lead in wins with eight. Saturday night, July 8, Aaron avenged a couple of prior losses to Syracuse by throttling the Chiefs, pitching shutout ball on seven hits and no walks through seven and two-thirds innings. He began the game in altudinous fashion, striking out the first two batters he faced. He also struck out the leadoff batter in the second. Oddly enough, it was the final K he would register that night. He pitched in trouble in the seventh and eighth, and even though he negated one runner in the eighth with a double-play grounder, the single that followed brought on Jake Reed who secured the 2-0 victory. The game brought Aaron's season ERA to 3.75 and his win-loss record to 9-4 in this, his 16th start. In the process, he earned honors as TD's minor league Pitcher of the Day. Good stuff. 24 years old, has decent offerings and certainly downward plane on his pitches due to his size. Realize he's only thrown 96 innings at AAA level, but could he be a post all-star break audition callup? Maybe he could due what Alex Meyer could not and just pitch versus throwing as hard as possible with little control. Edited by laloesch, 10 July 2017 - 07:59 AM.